Like many parents out there I was alarmed to hear about the alleged booksellers going door to door asking questions about our children. I had this happen to me about a month ago. A woman with a European accent came to my door to sell children's books and asked a lot of questions about my kids, as well as the neighborhood kids. I didn't let her in and didn't give her any information. 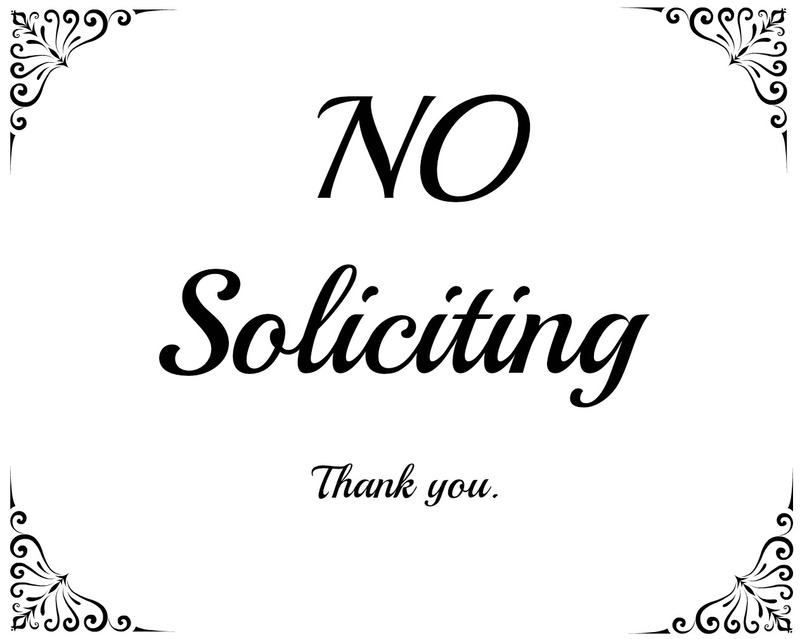 I also didn't think it was anything more than an annoying solicitor until I began to hear the stories on the news and around Facebook that these people are potentially dangerous and possible kidnappers. A local police department put out this warning: Message from Soda Springs police: The SSPD has received several reports of a man selling children's books in Soda Springs. Witnesses report being asked for names and ages of their children, as well as other personal and identifying information. This man also reportedly asks for information of other homes with children, including their names, ages, and other information. Witnesses also report this man to be aggressive when confronted. Individual is described as a white male, dark hair, eastern European accent, wearing dress clothes and a shoulder bag, and carrying a clipboard. Please use caution when encountering this individual. This may just be a hoax, but it is always a good idea to exercise caution in these situations. *NEVER let anyone into your home or give them information about your children. *Do NOT give information about your neighbors either. The woman who came to my door was sent by a neighbor. I was extremely annoyed that she had told a stranger about my children. *Teach your children to never answer the door for strangers or while home alone, while you are in the shower, etc. 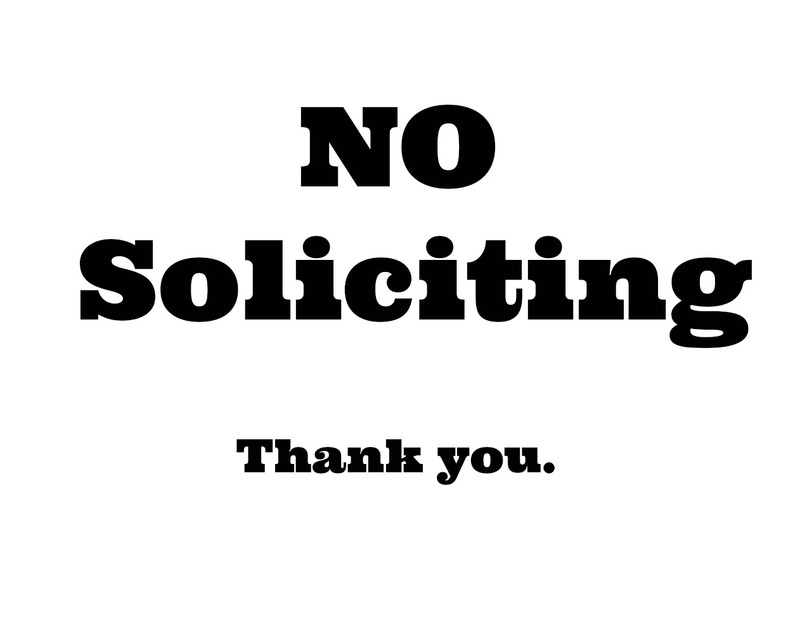 *Hang a "No Soliciting" sign on your door to help deter strangers. 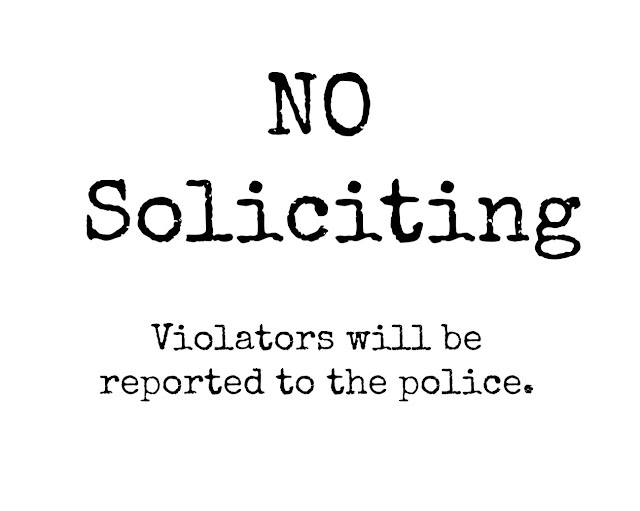 I have come up with a few basic No Soliciting signs in a few different designs: Fancy, Polite, and I Mean BUSINESS. Just click and save the image to your computer and print on your choice of paper. My friend just had this happen to her last week here in Cypress, TX just outside of Houston. He was VERY forceful and kept trying to get inside the door. Police here are saying they are targeting homes that show visual clues that children are present (toys in the yard, a playset out back, etc). I just make sure I never answer the door for anyone I do not know. It's just not worth it! Thanks for the printable, I was just talking to my husband about putting one up last night! Typically the believed wide lace top shelves are actually altogether seamless , nor switch for a typical wig shelves considering that wide lace top shelves are actually glued set. brazilian hair sale Extensive Wide lace top wigs are generally placed in any form, arrange through ponytails and / or buns, parted any way, not to mention is also created by using a hairstylist. brazilian hair uk 100% person mane facilitates typically the wig to always be washed, created not to mention gorgeous, but, it's tangle and / or mat prefer typical wigs. brazilian hair It again solely will make further experience to take who bit variety of extra money even on a premium wide lace top wig. Due to their fabulousness Wide lace top wigs have also become a widely used personal preference forHollywood the famous people.